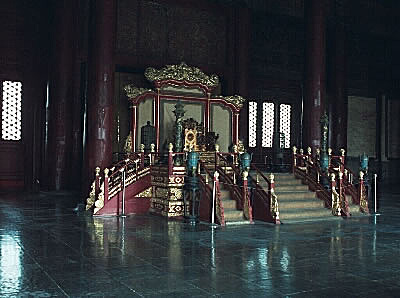 In 1421, after 17 years under construction, Yongle, a Ming emperor, became the first to occupy the imperial palace and residence. 24 Ming and Qing dynasty emperors followed him until 1911 when Puyi, China's last emperor of the Qing Dynasty, addicated the throne on the founding of the Chinese Republic. 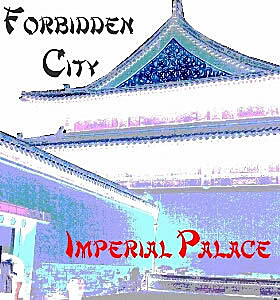 While it is known as the Imperial Palace many know it as the Forbidden Palace. It earned the name because ordinary people were barred from entering the grounds until 1911. 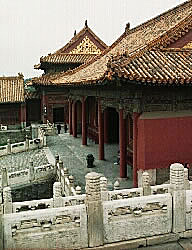 The palace occupies 170 acres and contains 8,706 rooms. 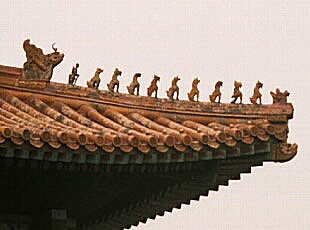 It is estimated that 8 to 10 thousand people lived within the palace to service the needs of the emperor. 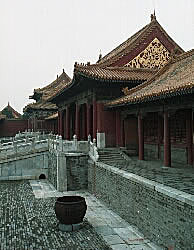 Eunuchs, up to 3 thousand of them, along with the emperor's maids and concubines lived within its 160 foot moat and behind its 30 foot high walls following the strict rules and rituals of imperial life. 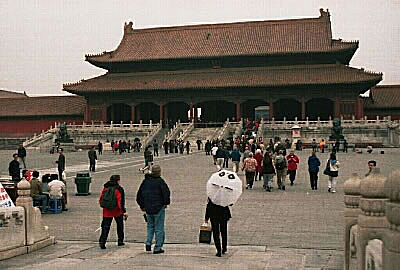 Anyone who would like to see what the Imperial Palace looks like should watch the movie "The Last Emperor." 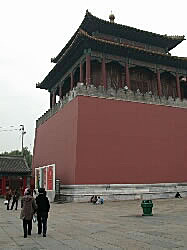 It was filmed on location and shows in much detail much of the palace grounds and its buildings. Of course the experience isn't the same as visiting the palace in person, but it will give you a good idea of what the palace is like. 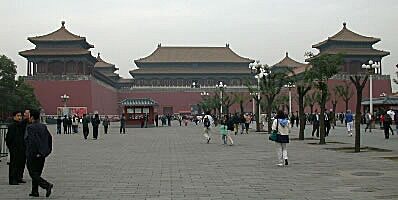 Passing beneath Mao's portrait and through Tiananmen, the Gate of Heavenly Peace, you enter a large courtyard heading toward the Imperial Palace. Before you lies Wumen, Meridian Gate, rising 117 feet. Here you purchase your tickets to enter the Imperial Palace. The first thing that strikes you about the palace is its immense size. It occupies 170 acres and, while there are many buildings of various sizes, contains areas of vast open space. Turning around and looking at Wumen you can see the bridges crossing the Goldwater River. 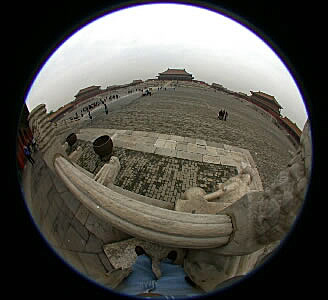 Passing through Wumen you have entered the Forbidden Palace and are facing the Gate of Supreme Harmony. From this point, rather than trying to provide a running commentary we'll go to just pictures and captions. It's impossible for me to accurately identify all of the buildings we saw, but I will caption those that I know. Enjoy the pictures.